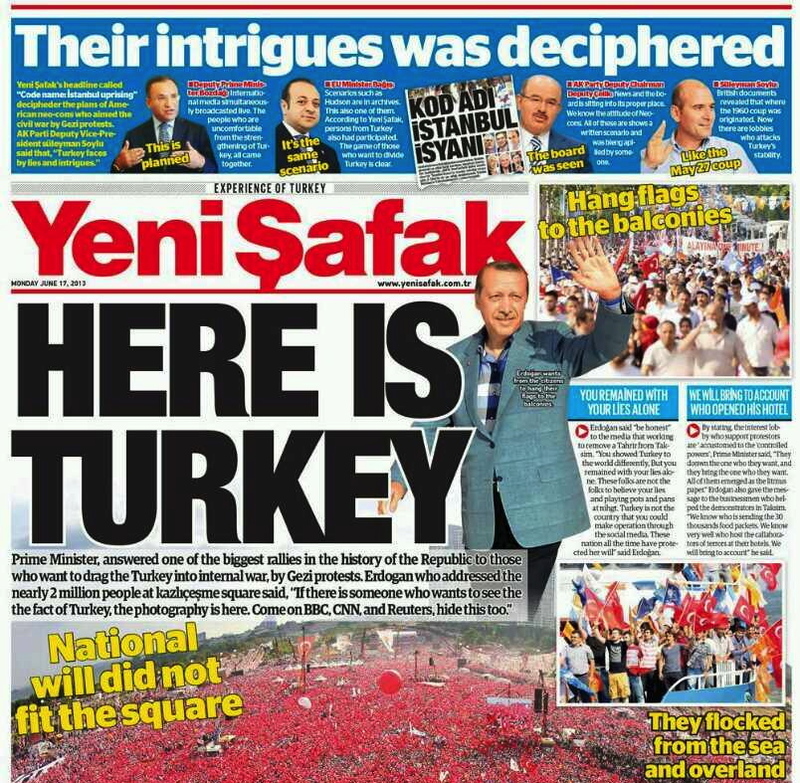 In a one-off front page in English after a huge Erdoğan rally, Yeni Şafak recently put across the pro-government version of Gezi Park. The previous month has seen most of Turkey’s mainstream media – already in tenuous orbit of the real world – spin off into outer space. This is the culmination of a process that’s been going on for quite some time now, but has been dramatically accelerated by the Gezi protests. For the past couple of years, it’s been clear that whenever serious crises strike with the potential to damage the government, the domestic media largely stays silent until Ankara offers an explanation, which it then prints uncontested. Many Turkish journalists say they first noticed this in the aftermath of the Van earthquake in October 2011, but I only noticed it later, with the Uludere tragedy in December the same year, when the Turkish military killed 35 Kurds in a botched airstrike. Last year I wrote a story looking at the issue of press self-censorship in the context of Uludere, which you can find here. The reason I’ve chosen today to write about this is that we’ve just witnessed one of the most blatant examples of the way in which the government is wrenching the Turkish media further and further from a credible representation of reality. Though not particularly shocking in a Turkish context, his words made explicit what some people already felt was an undercurrent of anti-Semitism in Ankara’s response to Gezi. The chief villain of the protests, according to the government, has been the ‘interest lobby’ – a shadowy group of international businessmen bent on leeching off Turkey and destroying its success. What happened next, however, is extraordinary. Atalay’s office issued a statement denying he had made the comments. “It is out of the question that the Deputy Prime Minister Beşir Atalay made a statement that the Jewish diaspora was behind Gezi Park incidents,” the press office said. This is about as categorical and demonstrable a lie as you can make, given the recording linked above. Nonetheless, his denial was reprinted without contradiction or contextualization by swathes of the Turkish press, including the state news agency (linked earlier). It was a good illustration of the corrosive effect that the government’s control over Turkish media (or, more generously, the Turkish media’s unwillingness to question the government) is having on the country’s political culture. Having made an embarrassing gaffe, Atalay’s people decided it was easier and less damaging to lie than to apologise. In making this calculation, they no doubt knew that most of the press would simply print his statement verbatim, accept it, and move on. This indicates a state of affairs in which politicians are utterly unaccountable for their own words and actions, even when making the baldest of lies. Of course, a critic would counter by saying that some Turkish press did report the controversy less charitably, so readers can decide for themselves what to think. This is true, however it also leads us to the real danger posed by this divergence between the pro-government ‘reality’ and the alternative narratives put forward in what might now be termed the ‘dissident’ press and the foreign media. The further Ankara’s narrative drifts into outer space, the more zealously it and its friendly news organisations will attack reporting that punctures that narrative and reveals its absurdity. Sure enough, in their denial of the ‘Jewish diaspora’ comments, Atalay’s press team attacked Cihan News Agency. “Unfortunately, a news agency twisted the remarks of the Deputy Prime Minister, which can be easily seen from reports published by other news agencies and voice recordings of his speech,” his statement read. If the government starts putting forward line that are obviously false, they will have to work harder to police the media, which in practical terms will mean the firing or ‘resigning’ of journalists who are unwilling to toe those lines, as well as increasing hostility and pressure on anti-government press. Indeed, in recent days, media organs friendly to Ankara have been purging reporters and editors. Yavuz Baydar wrote this excellent piece, published this morning, summarising recent developments. Monsieur Sarkozy’s face whitened as he pored over the latest sheaf of economic data from Turkey. Now this latest report on Turkey’s relentless rise to greatness was too much. His hand slowly clenched into a fist, which he smashed onto the desk. “He’s so bloody charismatic!” he squealed. His secretary looked up in shock. As he met her eyes, however, his face contorted into a sinister grin. After being ejected from the Elysee Palace, he had spent months bitterly reflecting on his failure to crush Turkey. Now, he had new, more powerful friends, and they just might help. “Sylvie! Get me Bolton!” he barked. A few minutes later he was on the phone with the former US Ambassador to the United Nations, and senior fellow at the American Enterprise Institute. “I’m looking at them now,” the latter replied through gritted teeth. “We must act!” Sarkozy seethed. “I’m not sure that’s enough, John. The Turkish people love Erdogan! You hear me? They LOVE him!” His voice quivered with barely-suppressed Islamophobia. “I still hate you,” Bolton replied coolly, but by that time the former president had already slammed down the phone. 04/07/13 – CORRECTION – Originally I wrote that the news agency targeted by Atalay’s office for ‘twisting’ his statement was Doğan; in fact it was Cihan. Thanks BM!